Design by Jan Puylaert | Copyrights 2017: 53e748f2e8ca0 & © 541bd832bd0b3. 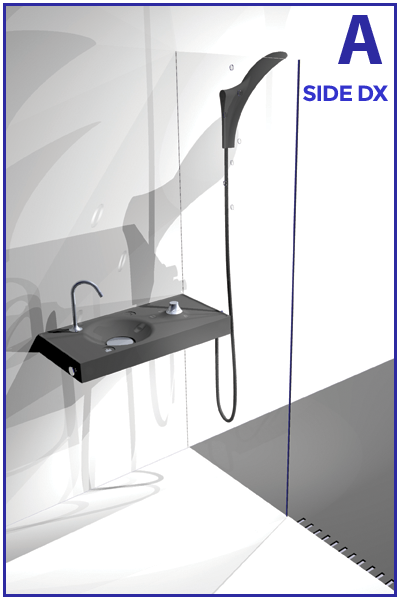 "A new concept for the bathroom"
HOST is a flexible and unique bathroom-SYSTEM specifically studied for the HOTEL sector in which the washbasin “hosts” all water-supplies for both washbasin and showerwall. This way no extra watersupply-connections are needed for the shower. This design avoids the need for any wall bracket to keep the showerwall in place. This unique & innovative way of installation keeps your wall completally free of any accesories. 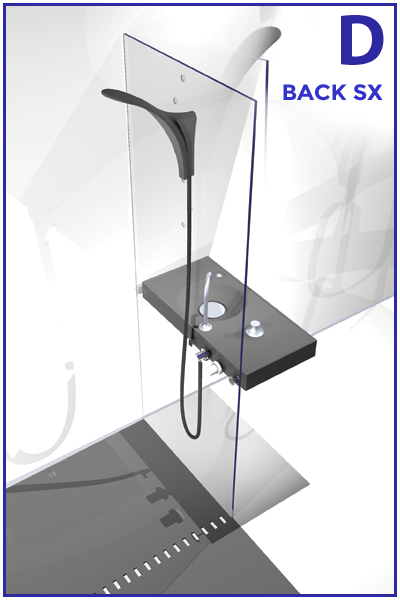 In fact, where in traditional shower situations the sliding-bar is normally mounted against the wall, in the typical HOST situation, the sliding-bar will now be mounted directally to the glass showerwall, which visibly cleans your space. ecopixel® is a sustainable material, 100% recycled and recyclable with pixelated appearance, for WET developed an special finiture called "delfts blauw" inspired on the blue and white pottery made in and around Delft in the Netherlands and the tin-glazed pottery made in the Netherlands from the 16th century. 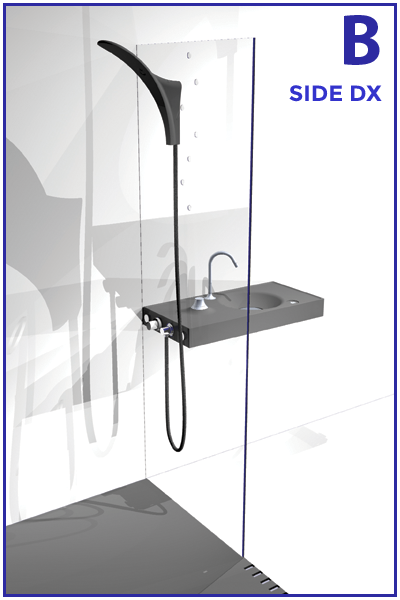 Integrated appliences for both washbasin and showerwall are complete with internal connections and come with a “structural” 3mm stainless steel mounting-plate that firmly fixes the showerwall against the washbasin which therefor avoids any extra wall-brackets. HOST comes with its own hydraulic connectors, No extra elements are needed. 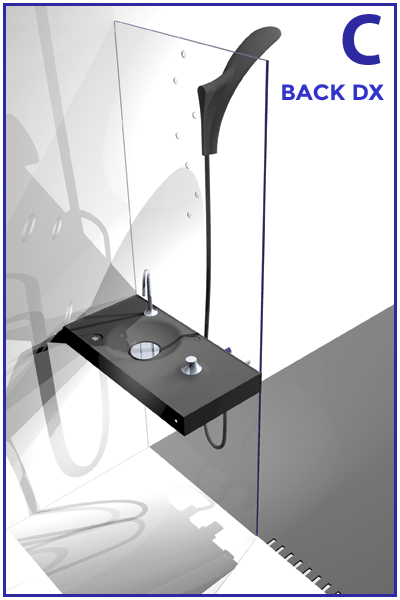 The specifically © WET developed deviator/mixer gives water to both basin and shower splitting up the watersupply equally between the basin wateroutlet and the showergroup. No extra connections are needed since the entire group is ready mounted with all neccesary connections included. HOST can be mounted in a large number of different situations, in both LEFT (SX) or RIGHT (DX) positions, in both directions, as well as even frontally, giving this way full freedom to your architectural needs. HOST offers, often in the smallest of places, a distinctive and minimal look to any bathroom, and can be equiped with showerdoor or can be simply mounted as a simple walk-in shower. These typical HOTEL-situations indicate the large possibilities HOST really offers for the HOTEL sector. HOST is the most flexible bathroom-SYSTEM that is offered to the market today, and WET is open for any customized size and/or material. This “HOST-WCF” syphon, included with the product, is an “all-age” wheel-chair friendly syphon. Customized models, in different dimensions, are available at minimum quantities. HOST has a speciall extra large syphon with 120mm of dameter : AC3 HST. It that can be customized under request in any RAL color. In the cleanest way, all watersupplies neatly dissappear inside HOST, where all further connections remain hidden from the eye. HOST is standard equiped with its innovative magnetized corners to complete and personalize your bathroom. HOST can be personalized in a distinctive way with your logo or message. mass coloured 100% PE fully recycable available in usual stock in “NEUTRAL ICE” WHITE. Available in a number of colors on request. The standard PolyEthylene (PE) version/material has been tested and applied for more then 10 years by WET®. PE is considered to be highly hygienic because of its oleophobic qualities. It has proved to be highly reccomendable for use in any bathroom for its easy to clean aspects and water-resisting qualities. The RAL colors are available for HOST and its components: MIXER and SYPHON. WET is used to the typical HOTEL-requests where every room needs the attention it deserves. Rooms might be slightly different and/or may have different levels or rates. Do not hesitate to ask for our numerous possibilities.